« Heavy Metal, Hard Rock And All Extreme Music Rules. Always Has, Always Will. The Big Bopper, (Jiles Perry “J. P.” Richardson, Jr.), was a pioneer of Rock ‘N’ Roll. 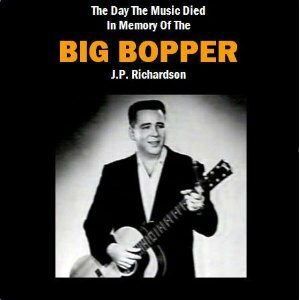 Singer, songwriter, musician and an American disc jockey, The Big Bopper’s multi-tasking career was truly cut short tragically in 1959. February 3, 1959 is historically known as “The Day The Music Died”, with the untimely passing of The Big Bopper, Buddy Holly and Ritchie Valens, due to their being in a small plane that crashed, from presumably flying into an Iowa blizzard. The pilot, Roger Peterson, also passed away from the crash. While growing up as a young lad, I remember this story being told to me time and again by my parents. Eventually, the multitudes of television documentaries on 1950’s Rock ‘N’ Roll more than adequately covered this tragically historic event. 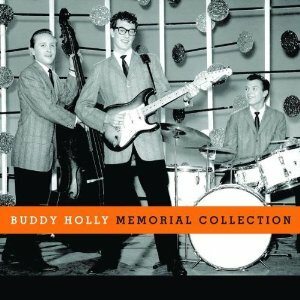 I can remember playing my mother’s Buddy Holly 45 rpm’s and thinking about that awful day in Rock ‘N’ Roll history. I took to heart, the reality of this event despite my adolescence, I imagine it was due to the way I was raised by my parents. The one true side story to this unimaginable day in 1959, was the one as told by Country legend, (the late), Waylon Jennings himself in many well documented articles and interviews. Apparently, Waylon Jennings was supposed to fly on this very same small plane, only he gave up his seat to The Big Bopper… due to The Big Bopper having the flu. Whoa. That is one side story I could not believe, even though I have seen documented footage of Waylon Jennings telling it himself. I guess when it is “your time”… that’s it. Waylon Jennings had a remarkably legendary career, singing and playing his guitar in the Country, Outlaw Country and Country Rock genres. I missed out on two opportunities to see Waylon Jennings live, both times he played very close to my hometown in Connecticut. One such venue was The Warner Theatre, in Torrington, Connecticut. This unreal cool and Art Deco Theatre still plays host to many incredible bands crossing all music genres, along with a diverse mix of entertainers and shows. From the late George Carlin to Foreigner… The Warner Theatre has had them all, it seems. Waylon Jennings passed away at the very young age of 64, back on February 13, 2002. I guess missing out on seeing Waylon Jennings two times, so close to home, serves as a reminder for me to cherish each Rock ‘N’ Roll performer and Metal Band I do get to see… from Slayer to Pat Benatar. Well, getting long winded on the roots of Rock ‘N’ Roll is something I’m very good at. It’s just the pure history, the factual beginnings of the music that I and so many billions of other people love so much, that I find so difficult to ignore. A fabulous, Classic and Rock Historical song is Chantilly Lace. Just the vocals of The Big Bopper are enough for me, while I listen to this song. Flamboyant and loaded with Rock ‘N’ Roll confidence were the vocals of The Big Bopper. Metal as my witness, his vocals alone are enough to put me in a great mood. “Oh baby you know what I like”! Just the way he describes this girl in Chantilly Lace is legendary. “A wiggle in the walk and a giggle in the talk”, “Make the world go ’round”… the lyrical rhyme scheme is Rock ‘N’ Roll perfection at it’s earliest beginnings. Despite Chantilly Lace being a Rock ‘N’ Roll song from 1958, there is something about it that radiates a relevant cool to me. This song always has been a “1950’s Rock ‘N’ Roll” favorite of mine, since the first time I heard it as a young lad. The incredible aspect about this song, is that there are no “in-your-face” guitars, drums or bass and it still Rocks like there is no tomorrow. The subdued volume of the instruments played on Chantilly Lace does help catapult the vocals of The Big Bopper and his enthusiasm for this song can’t be denied each time I hear it. The girl is referred to as “honey” and “baby” during Chantilly Lace, making for as true a listen into Rock ‘N’ Roll’s innocence as you could ever ask for. Compare “honey” and “baby” to some of today’s female referenced adjectives you hear in popular music… and yes, Chantilly Lace is innocence. I don’t like to think of “what ifs” when it comes to life, The Big Bopper was here and he left us all with some incredible Rock ‘N’ Roll. Chantilly Lace is a song that is immeasurable in it’s worth to Rock ‘N’ Roll History. I’ll always be a fan of The Big Bopper and be grateful for what he and his fellow peers accomplished back in those fabulous 1950’s. The Rock ‘N’ Roll seeds they all planted back then, have certainly grown into quite a remarkable existence in both music, culture and personal emotion. Rest in peace, The Big Bopper, Buddy Holly, Ritchie Valens, Roger Peterson, Waylon Jennings… and George Carlin too. This entry was posted on October 17, 2010 at 7:24 pm and is filed under 1950's rock music, people, Rock, rock & roll, rock 'n' roll, rock and roll, rock music, rock music news with tags 1950's rock 'n' roll, 1950's rock music, buddy holly, chantilly lace song, metal odyssey, Music, ritchie valens, rock and roll, rock and roll roots, rock music, rock music history, the big bopper, the warner theatre, waylon jennings. You can follow any responses to this entry through the RSS 2.0 feed. You can leave a response, or trackback from your own site. 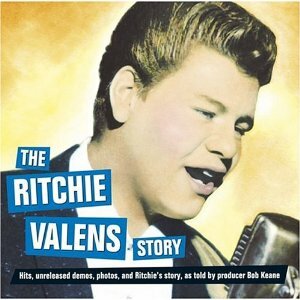 I knew Buddy Holly and Ritchie Valens died in a plane crash…but I don’t think I’ve ever heard of “The Big Bopper”. That was a terrible day in Rock ‘N’ Roll history… and this happened at the prime of these great musicians careers.